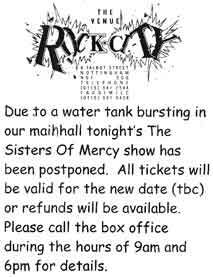 The first of the two gigs in Nottingham was postponed. 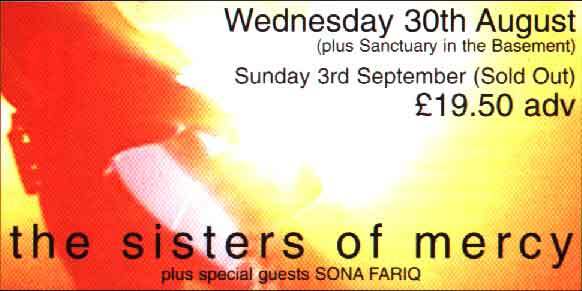 The new date is set to February 18 2001, which misses the 20 year anniversary of the first ever Sisters concert by two days. Dare we hope for a concert in Leeds two days earlier? Might not be such a bargin, I got an e-mail from the assistant Tour Manager on 23rd saying the first gig is now Manchester. I do not wish to cause any panic, but it might be a good idea to check if the venue is still selling the Gig. I only just picked this up here in an internet cafe in York, as I have been flying over Lancaster for the last week, and my microlite wasn't WAP enabled. STOP PRESS (dateline 27.8.2000): Getting off the slow boat from Dresden, we find Rock City making glum noises about an increasingly serious malfunction in their building. We are still mithering about it, but Rock City insist on rescheduling this gig to some later date while they get the venue guaranteeably safe for September 3. 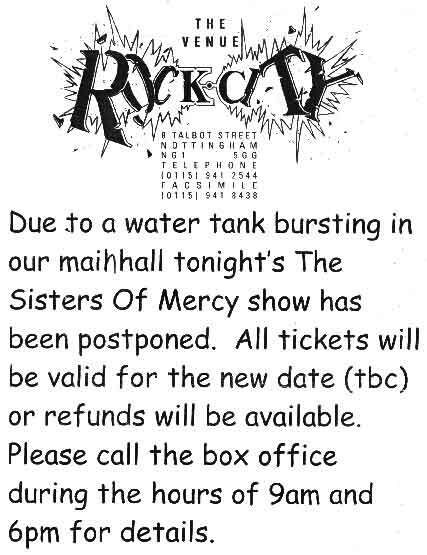 Please be advised that the concert on the 30/08/00 for the Sisters Of Mercy at Rock City in Nottingham has been cancelled due to a burst waterpipe. The tickets you have will be valid for the rescheduled date, Which is yet to be arranged, If this is not convienient please send your tickets back and on their return we shall give you a face value refund. Unfortunately everyone weren't lucky enough to be notified in advance. A group of Germans arrived in Nottingham only to find a note posted on the door of the venue (see scan). Some comments from the organizers were published in the Evening Post on August 30th. Scans by Christer Andersson (christe@nada.kth.se). Thanks to Tobias Dorf (heartwork@wtal.de) for the copy of the original cancellation note.